Andy Murray underwent hip resurfacing surgery which does not guarantee the Scot will be able to make a comeback, but will allow him to live a pain-free life. We look at his injury timeline. June 9, 2017 - Murray puts shaky form going into the French Open behind him to reach the semi-finals before losing to Stan Wawrinka but begins to feel the flare-up of a long-standing hip issue that had previously been under control. June 27, 2017 - Murray does not mention his hip problem after losing his first match at Queen's to Jordan Thompson but is forced to publicly acknowledge it when he pulls out of a scheduled exhibition match at the Hurlingham Club, move cited as precautionary. July 2, 2017 - After pulling out of a second Hurlingham match, Murray calms fears he may be forced to miss Wimbledon by confirming on the eve of the tournament he will play. July 12, 2017 - Walking with a noticeable limp, Murray battles his way into the quarter-finals but his title defence ends with a five-set loss to Sam Querrey. Afterwards, Murray insists he does not expect to be away from the tour for too long. August 26, 2017 - After pulling out of two Masters events and losing his world No 1 ranking to Rafael Nadal, Murray travels to New York intending to return at the US Open. But two days before the tournament he announces at a press conference he is pulling out, saying his hip is too sore to give him a chance of winning the tournament. September 6, 2017 - Murray heads home for further consultations with a number of hip specialists then announces he is likely to miss the rest of the year but is hoping to avoid surgery. choose this pic as the little kid inside me just wants to play tennis and compete. I genuinely miss it so much and I would give anything to be back out there." January 8, 2018 - Murray announces he has undergone hip surgery in Melbourne. In an upbeat assessment, he says surgeon John O'Donnell is very happy and he is targeting a return for the grass-court season. March 28, 2018 - Murray posts his first picture on social media after returning to on-court training at Patrick Mouratoglou's academy in Nice. May 8, 2018 - After Murray does not enter a Challenger tournament in Glasgow that had been earmarked for his return, it emerges he has suffered a setback in his recovery and has been forced to take more time away from the court. June 5, 2018 - Murray says he is "getting closer" to a return but pulls out of his scheduled first grass event of the season at the Libema Open in Holland. June 16, 2018 - After two weeks back on court, Murray announces just before the draw he will make his comeback at the Fever-Tree Championships at Queen's Club. June 25, 2018: Recorded his first win after almost a year out, beating three-time Grand Slam champion Wawrinka 6-1 6-3 in just 77 minutes at Eastbourne. July 1, 2018: He withdrew from Wimbledon with a "heavy heart" after saying his right hip was still not ready for the demands of a Grand Slam. August 3, 2018: Pulled out of his Citi Open quarter-final with Alex de Minaur in Washington, citing fatigue after his third-round win against Marius Copil. August 29, 2018: Murray's Grand Slam comeback ended in a four-set defeat by Fernando Verdasco after which he admitted he still had doubts as to whether he would ever recapture his best form. January 2, 2019: His persistent hip issue ended prematurely after a second-round defeat to Daniil Medvedev at the Brisbane International. January 11, 2019: Murray broke down in tears as he revealed he plans to end his career at Wimbledon. January 14, 2019: He suffered an epic five-set defeat on what was potentially his Australian Open farewell, falling to Spain's Roberto Bautista Agut in the first round. 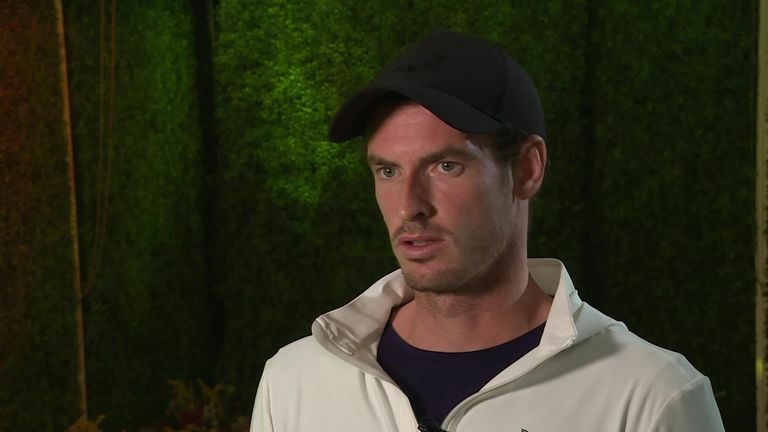 January 14, 2019: In his press conference Murray said he wanted "to keep playing tennis" and will consider his options before deciding whether he undergoes further surgery on his hip. January 29, 2019: Murray confirms he has undergone hip resurfacing surgery and says he hopes that will be the end of his hip pain. Check our news, reviews, reports and reaction at every major tournament by following us on skysports.com/tennis, our app for mobile devices or our Twitter account @skysportstennis.